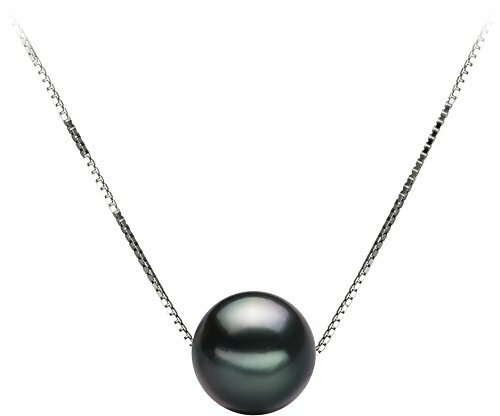 With an overall grade of AA, this black Tahitian cultured pearl is perfectly round and long-lasting in its free-falling design that is ultra-modern and sure to please. At 8 - 9 mm, the size of this special cultured pearl is quite impressive; the included 17.5 inch box chain is made of 14k white gold to ensure you won't soon be looking for a replacement for this one! This also makes a great gift for the woman who seems to already have an extensive jewelry collection - the floating cultured pearl is very unique and not often seen, so she'll surely be impressed! Your pendant will be carefully packed and shipped to you in an elegant velvet lined box and accompanied by lots of free extras. And, if you choose, we would be delighted to gift wrap your pendant and turn this pendant into an unforgettable gift. Each cultured pearl is beautifully unique and is made by a natural organism; no two cultured pearls are exactly alike. The cultured pearl color that you receive may vary slightly from that shown in the picture. Cultured pearls are playful with light, and depending on the light conditions you view them at, they will present a slightly different color - a fascinating phenomenon. We invite you to look at your cultured pearls in bright sunlight, on a cloudy day and inside your home. The change of color you will see will surprise and amaze you. We hope you enjoy the natures beauty and its unique color spectrum that cultured pearls offer.